I just wanted to take the opportunity to wish myself and my assistant a very happy (and very belated) blogiversary! We've come a long way since that very first post in December of 2008 in which I smugly announced that I'd be "bringing bundt back." I was wrong -- the classic, old-fashioned bundt has continued to be outshone and outfrosted by layer cakes and cupcakes, but I still have a soft spot for the modest little bundt that sparked Carrie Cakeaway and brought lil ol' me into existence. And what an existence it has been! A mere figment of my assistant's imagination, I've been able to play cake bartender and craft cocktail cakes made to taste just like their namesakes while continuing to experiment with and improve upon classic favorites. 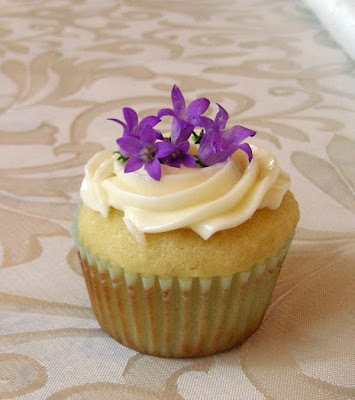 Oh, and how can I forget my biggest accomplishment to date: showing the world that cupcakes can do a whole lot of good. It's been a huge learning experience for my assistant in everything from food chemistry to cake decorating to customer service, and there's plenty of learning ahead. One thing's for certain: despite learning the hard way that flour and powdered sugar make the wildest messes (particularly when airborne), getting used to smelling almost permanently of butter and sugar, and occasionally opening the oven only to find a failed, fallen cake inside, my assistant has simply fallen head-over-heels in love with cake and the entire process of this little operation, from creation to delivery. Kids with birthdays so close to Christmas find that it sure is hard to compete. With all the shimmering tinsel, glistening lights, and sizeable holiday to-do lists, it's easy for folks to lose sight of birthdays in the 20-somethings of December -- and terribly disappointing for those who grew up with post-holiday "I'm sorry this is so late..Happy Belated Birthday!" greetings and a single HappyBirthdayMerryChristmas present when all the other kids got two. Anyhow, my assistant and I weren't going to let Vic's birthday go by unnoticed -- and neither were his friends! 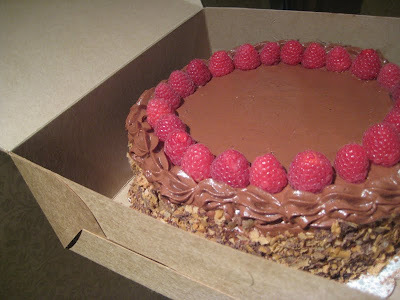 What better surprise to give to the birthday boy than a triple layer cake featuring his favorite dessert flavor combination: chocolate and raspberry? 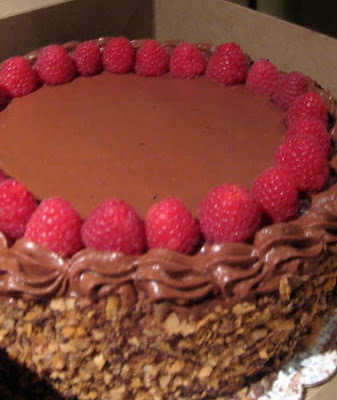 That's right folks, my Triple Layer Raspberry Chocolate Decadence features smooth, luscious chocolate paired with the sweet, delectably tart little raspberry in three layers of rich chocolate cake filled with raspberry jam and generously frosted with milk chocolate mousse frosting. Lace the sides with crunchy chocolate cookie crumbs, top it all off with fresh raspberries, and you've got yourself a cake fit for a king. Or at least a very special birthday boy. Happy birthday, Vic! Hope you enjoyed the cake as much as we enjoyed crafting it. Posts are long overdue! It's been rough without my assistant's camera ever since she lost it during our hugely successful charity bake sale over the holidays, and Santa did not give her a new one for Christmas. I'm sure I made his nice list, but I bet he has a hard time delivering gifts to us imaginary folk. Anyway, my assistant's working on collecting photos from the cameras of friends and family members, and will update this blog soon! We haven't even celebrated our blogiversary yet - sheesh!